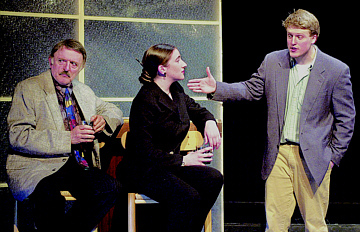 John Astin, Kateri Chambers and Loren Dunn in 'Bluff,' the inaugural presentation of Johns Hopkins University Theatre. Celebrating the return of an undergraduate theater program, the newly named Johns Hopkins University Theatre will open its inaugural season with a production of Jeffrey Sweet's Bluff on Friday, Sept. 17, and Sat., Sept. 18, in the Baltimore Museum of Art's Meyerhoff Auditorium, adjacent to the Homewood campus. The company, formerly known as the Hopkins Studio Players, was created by faculty member John Astin and is composed of students, professional actors and Astin. Sweet's play tells the story of a young couple who falls in love while aiding the victim of a mugging. It deftly mixes comedic dialogue with its serious subject matter and was nominated for an American Theatre Critics Association Award. Sophomore Kateri Chambers and 2004 grad Loren Dunn hold the lead roles and are joined by local actress Laura Gifford. All three played to rave reviews in last year's production of Our Town (Chambers and Dunn as Emily Webb and George Gibbs, respectively, and Gifford as Mrs. Gibbs). Astin also will perform in the play. This production coincides with the launch of a revived theater program at Johns Hopkins and the establishment of a permanent home for the program in Homewood's Merrick Barn. Decades ago, when the Writing Seminars was known as the Department of Writing, Speech and Drama, the Barn housed its drama activities. Astin, best known for his role as Gomez in the original Addams Family television series, is a graduate of that former department who returned to Johns Hopkins in 2001 to teach acting and directing. Since then, he has led a renaissance of the school's theater program. In establishing a home base for the program, Johns Hopkins plans to renovate the space to include a classroom, an office and a shop for set production. The 2004-2005 season for Theatre Hopkins, a semiprofessional group that uses the Barn, will not be interrupted by the renovations. Both performances of Bluff will begin at 8 p.m. Tickets are $15, $14 for seniors, $10 for BMA members and $5 for students. Call the Johns Hopkins University Theatre box office at 410-516-5153 for tickets or e-mail your ticket request to hut@jhu.edu. Mon., Sept. 20, 7 a.m. to 5 p.m. "Corporate Emergency Preparedness: Protecting Your Own," conference providing detailed, practical strategies businesses can use to protect employees while ensuring continuity of business operations during and after a public health crisis. Speakers will include representatives from American Institutes for Research, D.C. Dept. of Health, Federal Emergency Management Agency, George Washington University Medical Center, Haz/Mat DQE, Disaster Planning International, Ingenix Center for Health Care Policy and Evaluation, JHU, MBNA Corp. and Whiteford, Taylor & Preston. Sponsored by the JHU Center for Public Health Preparedness. Registration and fee required; for more information or to register, go to www.jhsph.edu/cphp. Sheraton Inner Harbor Hotel, 300 S. Charles St.
Fri., Sept. 17, 7:30 a.m. "Bioinformatics and Its Role in Biodefense," breakfast meeting addressing the relationships between databases and biodefense research; the use and interpretation of data; existing databases; and analysis tools available to researchers; featuring a panel of speakers. Sponsored by JHU and the Technology Council of Maryland's Bioalliance. Montgomery County Campus. Tues., Sept. 14, 6:30 p.m. "Patents," by Tony Stanco, George Washington University, and Ray Dizon, Md. Dept. of Business and Economic Development. Sponsored by the Emerging Technology Center. To reserve a place, call 410-327-9150. Part of the "From Start-Up to IPO" lecture series. 3rd floor, JH@Eastern. Tues., Sept. 14, 1:30 to 3 p.m. Open House for the Johns Hopkins Undergraduate Fellowship in the Humanities, intended for undergraduates who want to live, study and intern in D.C. For information, go to www.jhu.edu/advanced/ugrad.html. RSVP to aaprsvp@jhu.edu. Sponsored by Advanced Academic Programs. A&S Washington Center. Wed., Sept. 15, 6:45 p.m. Thurs., Sept. 16, 9:30 a.m. Tashlich following services. Fri., Sept. 17, 9:30 a.m.
Wed., Sept. 15, 6:45 p.m. Thurs., Sept. 16, 9:30 a.m. Mon., Sept. 13, 5:30 p.m. Reception inaugurating the Master of Science in Bioscience Regulatory Affairs degree (pending MHEC endorsement). Building 3, Montgomery County Campus. Fri., Sept. 17, 6 p.m. "Responding to History and Place," a Sculpture at Evergreen event with guest curator Jennifer McGregor and other artists. Evergreen House. GO TO SEPTEMBER 13, 2004 TABLE OF CONTENTS.